Forbes article re; Lead Paint Makers fighting accountability for manufacturing and selling poison lead paint. I am the editor of the Cook County Record. In ruling that three paint manufacturers have known since the early 20th Century of the danger the use of lead paint inside homes posed to children, a California appeals court has upheld the bulk of a judge’s reasoning in ordering the paint companies to pay more than $1 billion for their alleged contributions to a “public nuisance” caused by the continued presence of lead paint in old homes. In its Nov. 14 decision, the three-justice panel of the California Sixth District Appellate Court, however, pared the judgment back a bit, saying the paint companies should only be held responsible for funding the investigation and removal of lead paint from homes in seven of California’s most heavily populated counties and three of its largest cities – which, according to estimates provided in the decision, could amount to nearly 1.6 million homes across the Golden State. The panel declined to estimate the extent of the cost for which the companies may be on the hook now, however, sending that question back to the Santa Clara County court to decide. The defendants have pledged to appeal the decision to the California Supreme Court. The opinion was authored by Justice Nathan M. Mihara, with justices Eugene M. Premo and Frankin D. Elia concurring. The decision comes as the latest scene in the litigation dating back nearly two decades, when the counties of Alameda, Los Angeles, Montery, San Mateo, Santa Clara, Solano and Ventura, and the cities of Oakland, San Diego and San Francisco first filed suit against a number of paint manufacturers that had in the past manufactured and sold lead-based paint. The municipal governments had argued the paint merchants should be held liable for promoting the use of toxic lead paints inside homes and other residential buildings until lead-based paint was banned in 1978. In 2013, at the end of a six-week trial and after 13 years of litigation, Santa Clara Superior Court Judge James Kleinberg, who has since retired, ruled for the municipalities, saying the manufacturers must pay to remove or otherwise abate lead paint in millions of homes because the presence of the paint alone constitutes a “public nuisance” under the law. 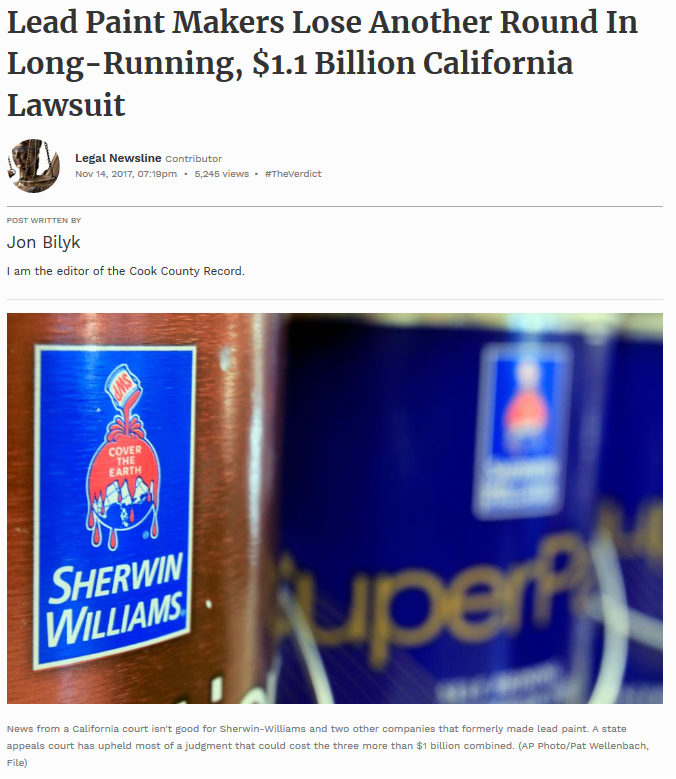 He later ordered three companies alone – NL Industries Inc., which sold paint under the Dutch Boy brand, The Sherwin-Williams Company and ConAgra Grocery Products, which at one time owned the Fuller paint brand – to pay $1.15 billion to fund a program to investigate homes for the presence of lead and remove lead paint from an estimated 3 million California homes. The judgment prompted an appeal from the companies in 2015, and attorneys for each side argued the case Aug. 24 before the Sixth District panel in San Jose. Attorneys for the paint makers argued Judge Kleinberg’s ruling was unprecedented and flew in the face of longstanding legal precedent, usurping the role of the state legislature and Congress in establishing a new lead remediation program and ordering the three companies to pay for it. And they said the judge did all this without even establishing the companies knew lead was as toxic as is now known, or that they could be held responsible under any California law. Essentially, they argued, the judge had ordered them to act as the insurers for the entire paint industry, simply because they have managed to stay in business since the early 1900s. The judge, they contended, was opening a Pandora’s box of trouble, not only for them, but for all companies in all industries, everywhere in the U.S., that may have ever sold a product at one time that was later found to have public health consequences. The plaintiffs argued the companies had known since at least the 1920s that the lead pigments used in the paint posed a significant health threat to children, yet continued to sell the paints and market them for use on the interior of homes, in some cases, until the 1940s. The plaintiffs argued removing lead paint should be treated as environmental contamination, similar to water or air pollution, the cleanup of which state and federal governments have ordered other private companies to pay. And the benefits of removal would far outweigh the cost, they said. And in this case, the Sixth District court found Judge Kleinberg had not overreached in finding the companies had marketed and promoted the use of lead paint, leading landlords and homeowners alike to coat the interiors of homes with the toxic substance. In its Nov. 14 decision, the Sixth District panel particularly pointed to promotional campaigns carried out in the early-to-mid-20th Century through the Lead Industries Association (LIA), in which NL, Fuller and Sherwin-Williams all participated. “The LIA’s extensive advertising campaigns, in which all three defendants participated, affirmatively promoted to painters, architects, retailers, and consumers the use of lead paint on residential interiors, and each defendant also individually promoted to consumers lead paint for use on residential interiors in the 10 jurisdictions,” the justices wrote. Further, the justices rejected the defendants’ argument they should not be held liable, because no one could demonstrate which manufacturer was responsible for lead paint in specific California homes, let alone specific California communities. “This contention misconstrues the basis for defendants’ liability,” the justices wrote. “Defendants are liable for promoting lead paint for interior residential use. The justices said other courts could hash out how much each company should be made to pay. However, the justices overturned a portion of the judgment, saying Kleinberg went too far in ordering the companies to pay for homes in which lead paint was applied after 1950, the year most agreed the paint industry specifically began telling painters and homeowners not to apply the paint inside homes. Lead paint was made illegal for sale in the U.S. in 1978. According to estimates provided in the decision, the companies could have been on the hook for lead paint investigation and removal in nearly 4.8 million homes in the seven counties and three cities. “While we can accept the inference that defendants’ pre-1951 promotions increased the use of lead paint on residential interiors during the period of those promotions, we reject plaintiff’s claim that it is a reasonable inference that the impact of those promotions may be assumed to have continued for the next 30 years,” the justices said. In response to the ruling, attorneys for the paint manufacturers issued a joint statement, pledging to appeal the decision. NL was represented in the action by attorneys with the firm of Bartlit Beck Herman Palenchar & Scott LLP; ConAgra was defended by the firm of ReedSmith LLP; and Sherwin-Williams by the firm of Jones Day. Danny Chou, assistant county counsel for Santa Clara County argued the case on behalf of the municipal plaintiffs.